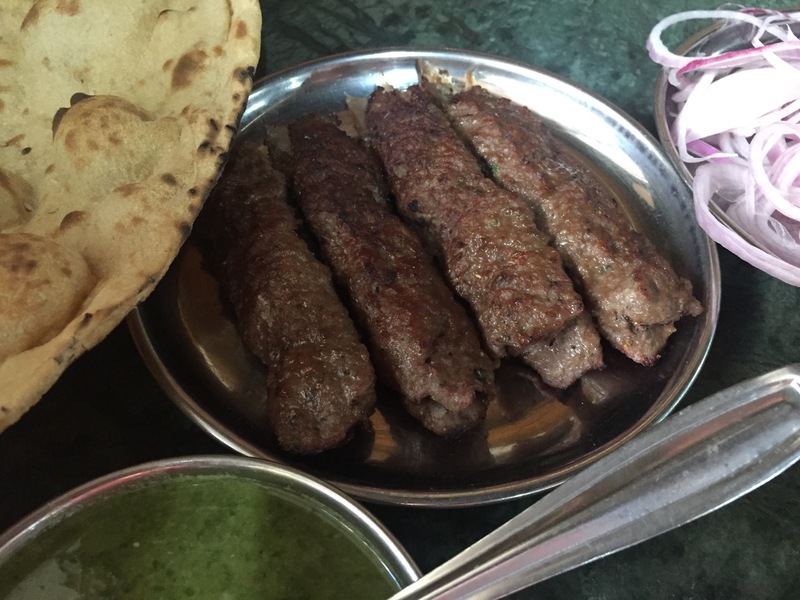 Sarvi Restaurant been in Mumbai for 90 years and supposedly has the best kebabs in the city, a claim worth a visit. A crazy taxi ride across town takes us to an insanely busy single lane street off Nagpada Junction. Our only reference point is the local police headquarters which is simply a gateway into a dusty overgrown yard with barracks and ancient British buildings. Sarvi restaurant looks burned out, and has no signage, so we’re not sure we have the right place until we get confirmation from the manager working the cashier desk. He tells us to take any seat, so we grab the corner for people watching. Four cats wander the dining room, and traffic tears by with horns blasting. Signs on the wall warn us in two languages to pay the cashier, not our waiter. It is utterly disconcerting and alien. 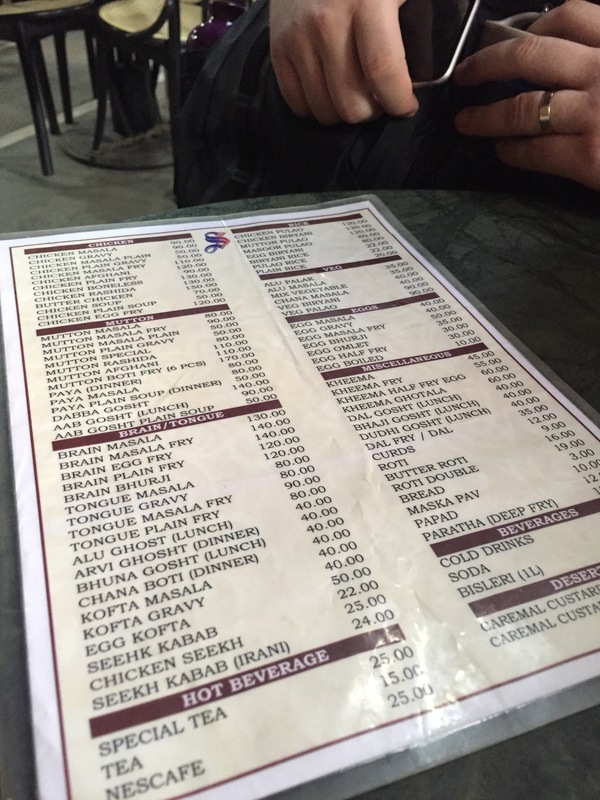 The waiter speaks almost no English, but brings us a menu with items and prices clearly listed. He latched on when I say I heard they have good kebabs, and points out the Seekh Kebab and Chicken Seekh Kebab, and warns they take twenty minutes to prepare. Feeling. no rush, we order one of each, plus the butter roti (flatbread). The wait gives us time to people and traffic watch. When the food comes out, we’re surprised. Given the prices I expected undersized portions that we’d have to order more. 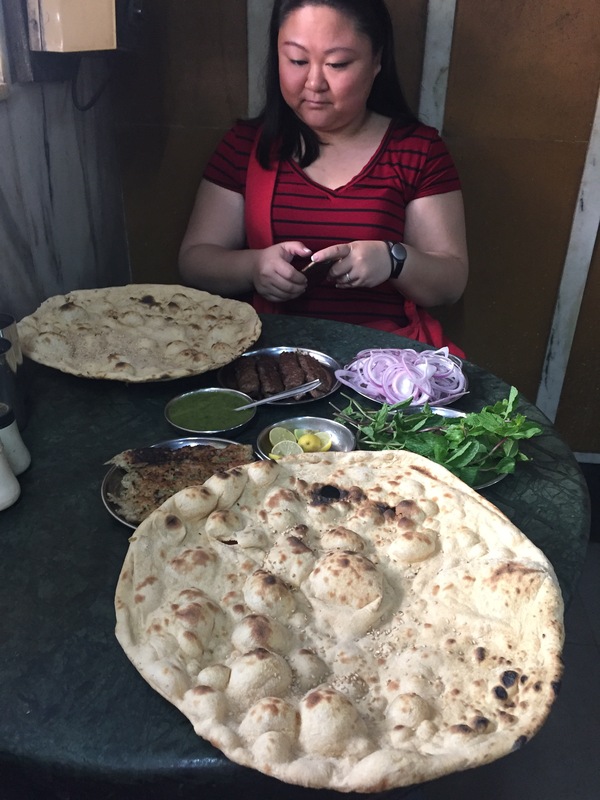 But instead we get a perfect portion of each of the kebabs, and two huge flatbreads that fill the table. The kebabs are like Persian koobideh, meat that’s been minced and mixed with spices before being grilled on a stick. 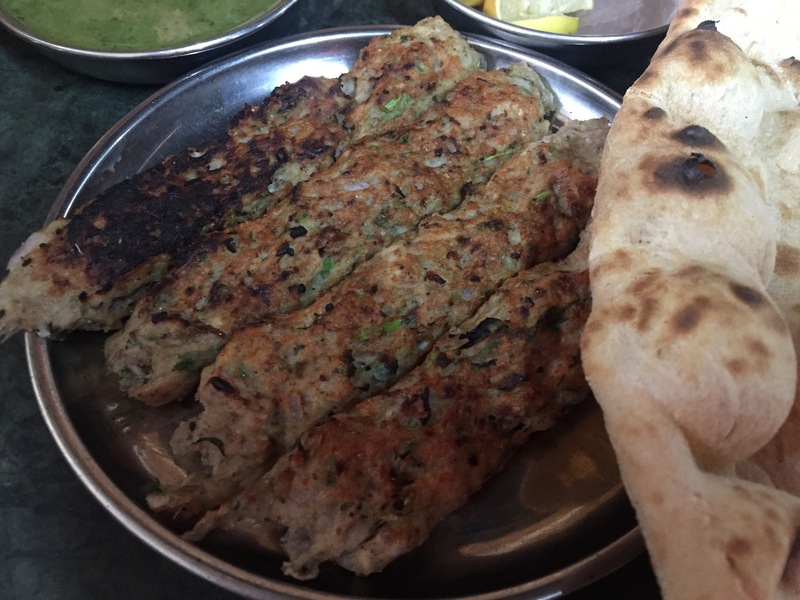 The Seekh Kebab turns out to be lamb, perfectly tender with a slightly crunchy exterior. The spices complement the meat, and its not dry at all like I was expecting. Rumor has it they mix papaya into the meat, but I’m sure it’s a secret family recipe. The chicken kebab turns out to be even better. It doesn’t have as crispy of an exterior, but assuming it’s the same herb and spice mixture, the flavors are much more enhanced and contrast the chicken nicely. 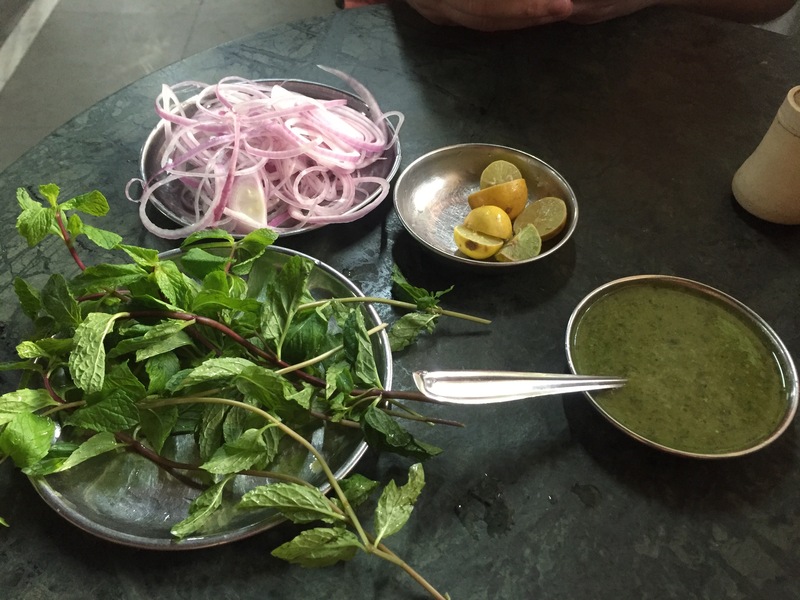 There’s just a little bit of heat, and the herbal flavors with moist chicken are simply amazing. On the side was a minty spicey sauce, some fresh mint, red onion an and tiny little lemons. A dash of each on the flatbread with the kebabs makes for an amazing dish I’m anxious to replicate at home. Now, the best part, the bill. 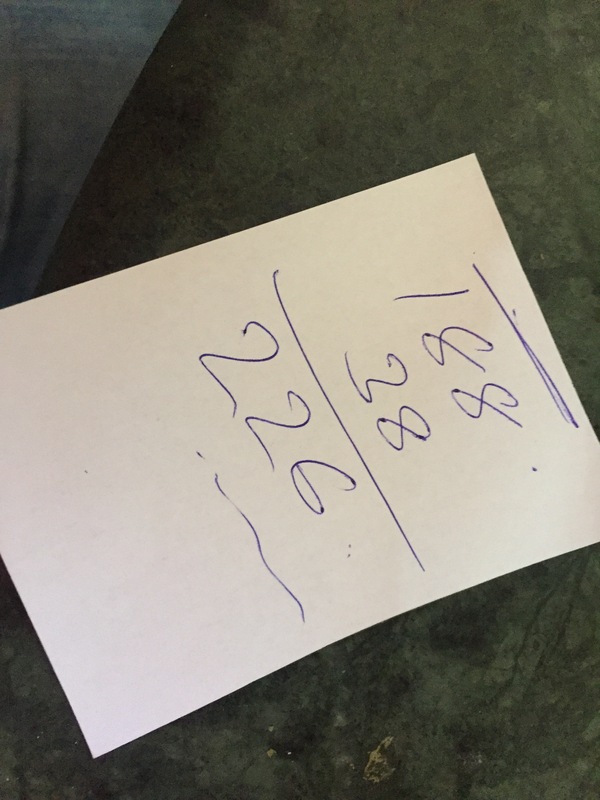 226 rupees. Even when you throw a generous 30 rupee tip on that, we’re still only out of pocket less than $4 US. This was well worth leaving the tourist path to find. 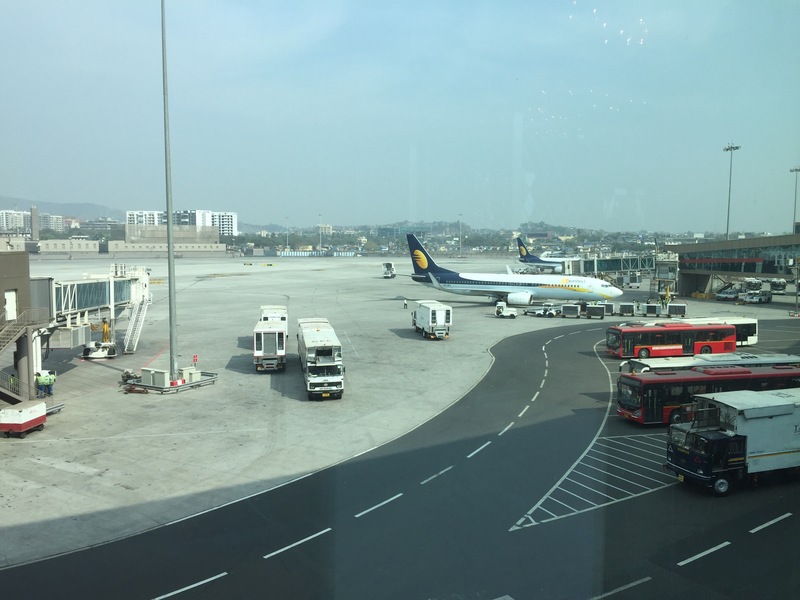 If you fly premium economy on Vistara airlines, you have the opportunity to buy lounge access in Mumbai for $15. It’s totally worth it. 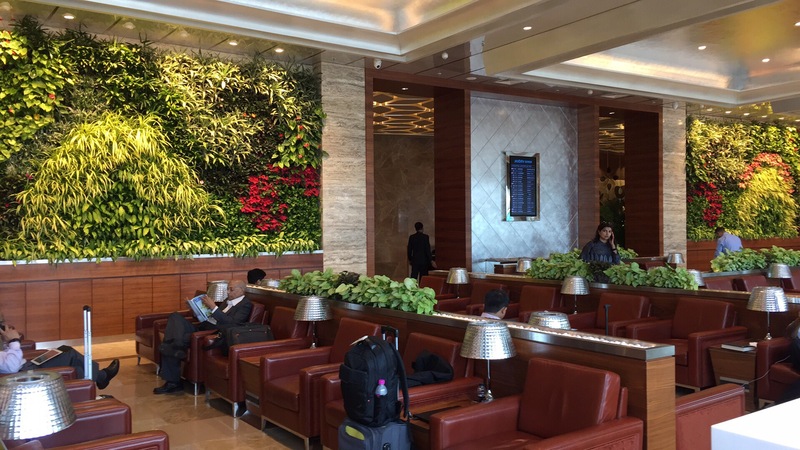 Alcohol and spa treatment are charged extras, but the free food, drinks, and luxurious toilets in Mumbai’s new Terminal 2 lounge make the hectic nature of Indian travel something you can avoid. The terminal itself is gorgeous, well maintained, and full of luxury shopping and dining. So even without lounge access, T2 is clearly worth waiting in. The buffet had a smattering of western pasta dishes and some local favorites. 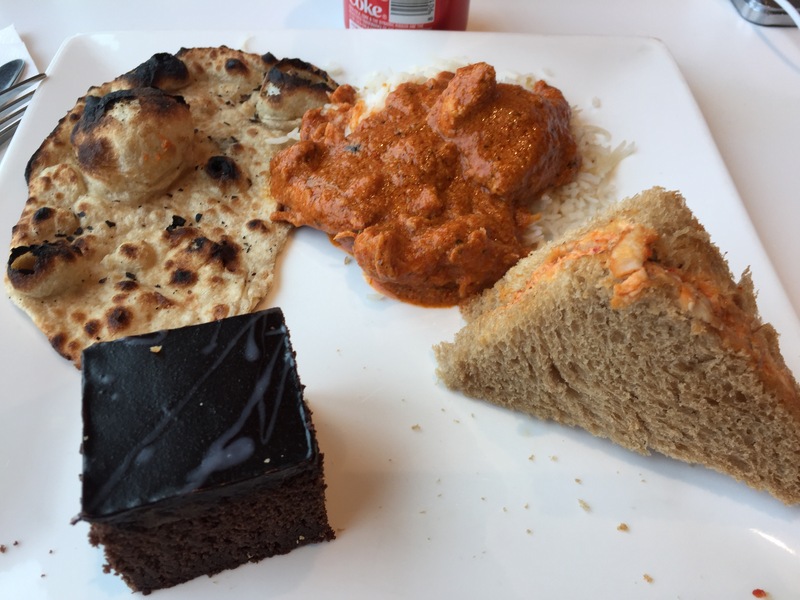 Heaped on my plate is some roti (flatbread), butter chicken, a “sticky chicken” sandwich, and a chocolate brownie. The sandwich, I think was a typo that should have been “spicy chicken”. It’s a chicken salad with peppers and some various curry spices on brown bread. The butter chicken was just the right amount of spice, and the basmati rice perfectly cooked. So splurge on that $15. If you buy a lunch and latte at the Starbucks in the terminal you’ll probably spend about as much, and wouldn’t have free wifi. After watching Iron Chef and Iron Chef America so many times, there’s no way I’m passing up the oppurtunity to dine at a restaurant by Morimoto. 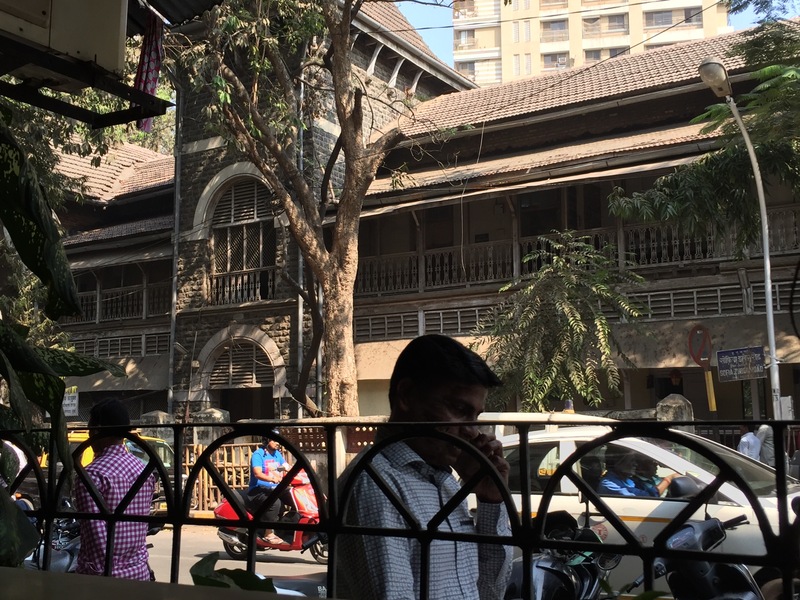 He’s branched into the Indian market with Wasabi (unoriginal name) at the Taj Mahal Palace hotel in Mumbai upstairs from the city’s first licensed bar. I’m curious to see if the dishes are tuned to an Indian palate, if it’s a more straightforward portrait of his usual eclectic plating, or a Japanese representation. 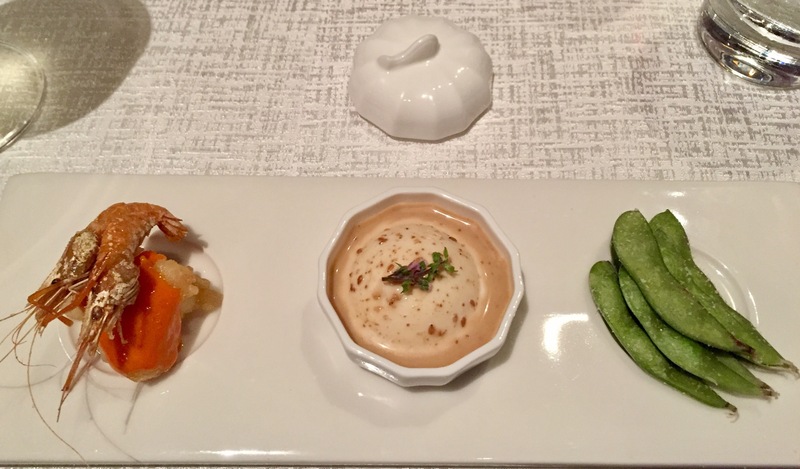 Starting the meal we have an amuse bouche trio consisting of edamame, whole shrimp on a lobster puff with a spicy sauce, and in the middle a chilled tofu with a truffle ponzu sauce. Did you notice, these are arranged to form the Indian flag? According to my wife, the toro tartare turned out to be disappointing. She was expecting the cool fresh taste of tuna, but it turned out to be salty from the miso broth base and the caviar. 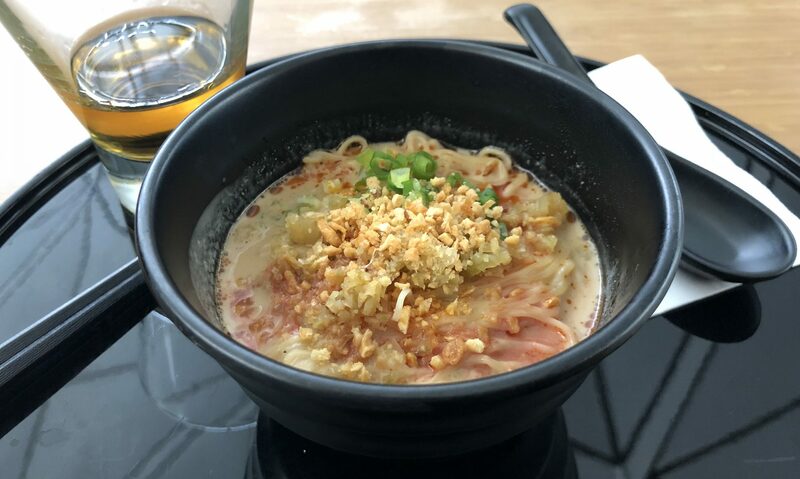 The smooth texture was ruined by the crunchy rice balls because they didn’t provide the contrast that his similar dishes in other restaurants have, mostly because they get all mixed in. Tuna Pastrami sounded intriguing, and it was worthy of the name. 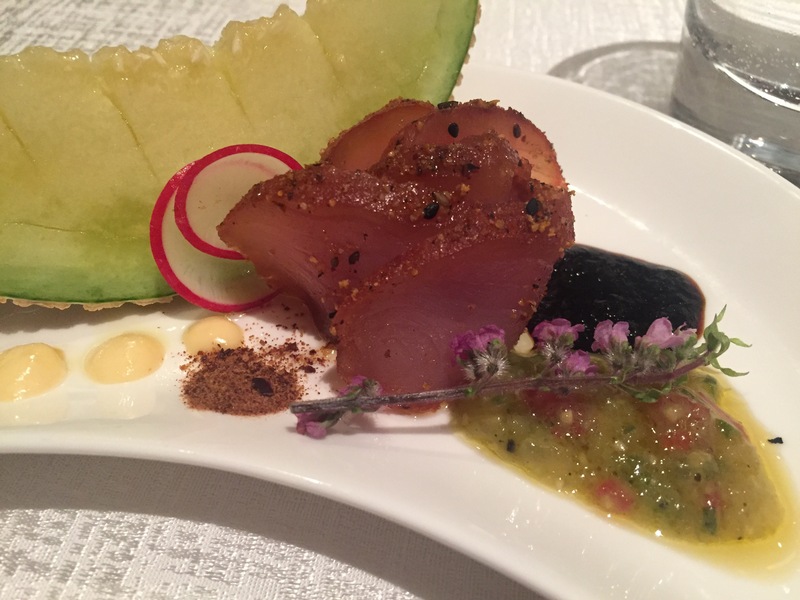 Lovely ahi tuna was lightly smoked and crusted with peppercorn and sliced formed into a rose. Served with four different types of meaty spices, this is a complex dish: a salsa verde, a smokey soy barbecue sauce, cayanne dry spice rub, and a wasabi mayo. Finishing it off was fresh honeydew to cleanse the palate. 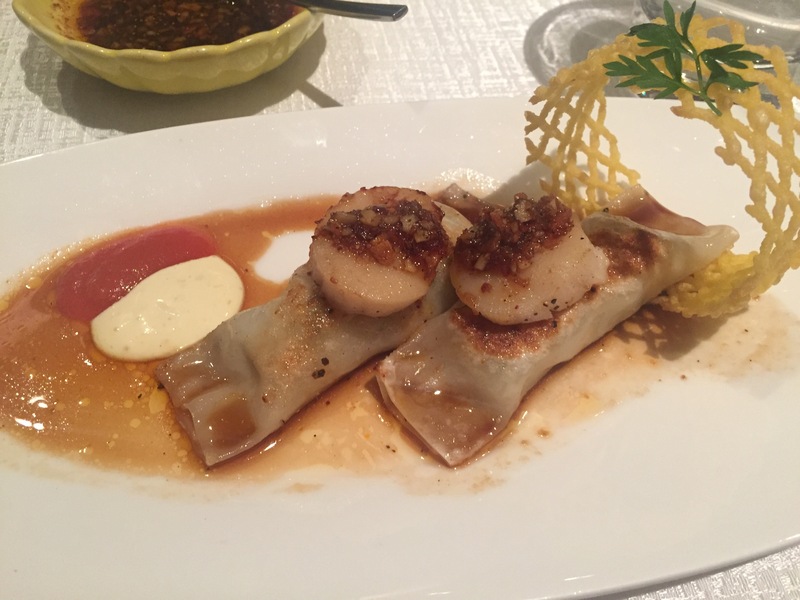 Two perfectly cooked scallops sit on top of two perfectly cooked al-dente chicken and scallop gyozas. Drenching it is a typical gyoza sauce laced with toasted nuts, and on the side, a dollop each of the same wasabi mayo and a tomato sauce. Finishing the garnish is a ring crisp made of pumpkin, a nice homage to a popular pre-dinner snack commonly found in this area of India. Again though, my wife was a little disappointed in her choice. 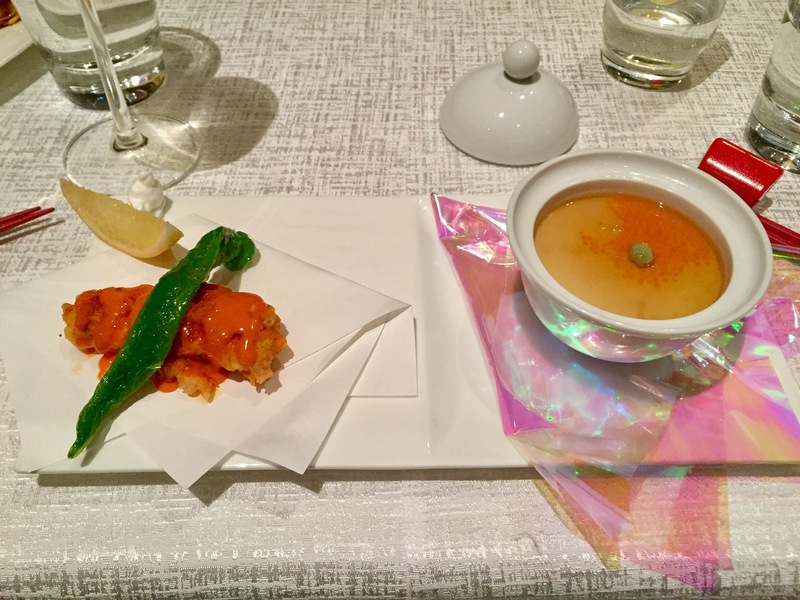 The plating of this langoustien and tofu dish was exquisite. The roasted shishito pepper was delicious, and the tofu gets great marks for being a totally different recipe topped with masago (roe) and wakame broth was rich in umami while a simple tofu dish. But the langoustien was a let down. The tempora was thick and soggy, and the same spicey sauce from earlier overwhelmed the dish, leaving what should be a wonderfully sweet shellfish completely unidentifiable. 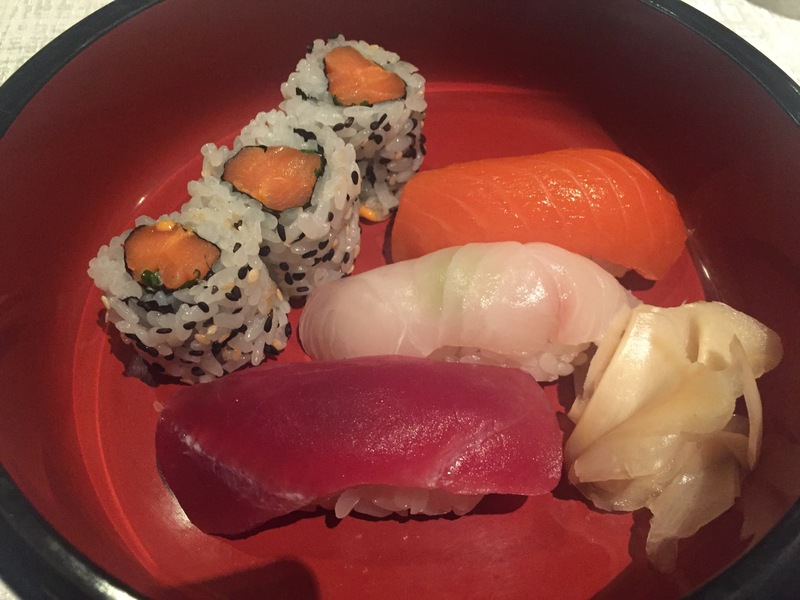 A typical sushi trio of a white fish, fatty tuna, and salmon along with a spicy salmon roll has rice that’s overly cold, and the fish shows how difficult it must be to get sushi-grade product in this city. The texture is good, but the quality not what we’d expect. 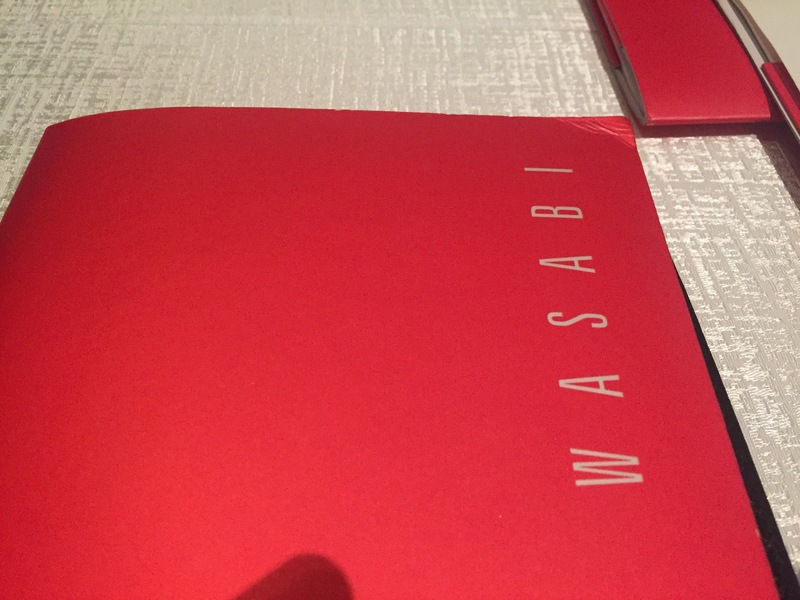 The real wasabi grated fresh at the table was a nice touch, but not enough to overcome what should have been a more appreciable dish given the name of the chef on the door. 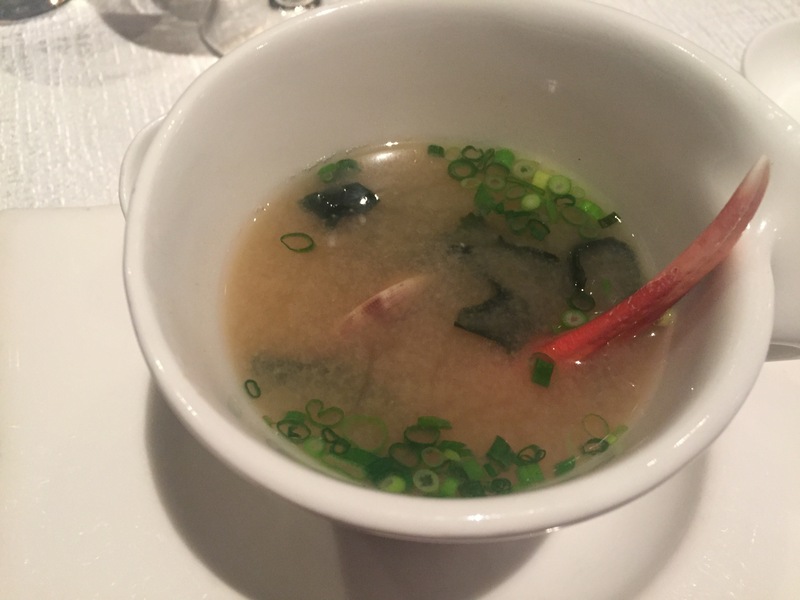 The hottest miso soup I’ve ever been served comes with two beautiful clams floating in it, and a rubbery langoustine claw that’s been overcooked because of the heat of the broth. 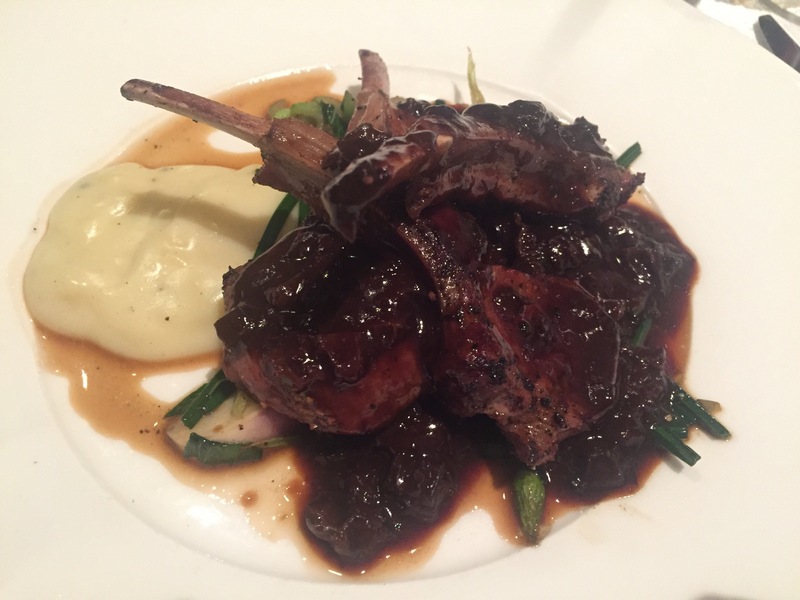 These slightly over cooked (medium instead of medium rare) lamb chops are heavily peppered, then sit on a bed of green onions and turnips, then excessively slathered with that same soy barbecue sauce from earlier. This is an unfortunately poorly executed take on a great idea. 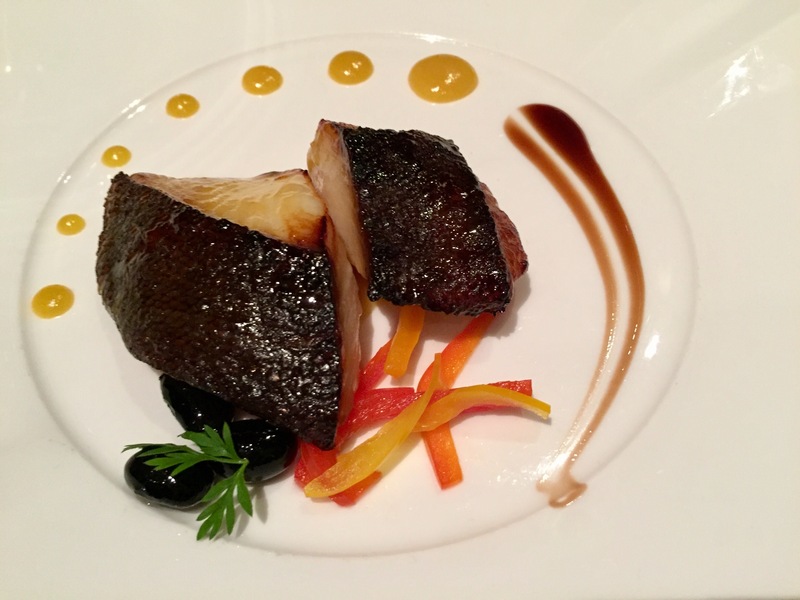 A generous serving of cod is sweet and buttery, but at the same time, a bit salty. The opposite of the lamb, it’s just slightly undercooked, making it difficult to break apart cleanly with chopsticks. 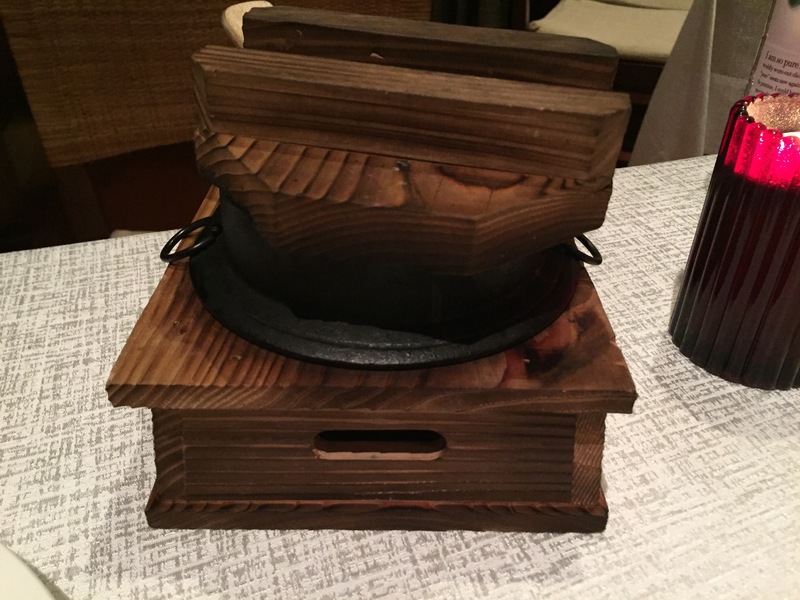 Served on the side of the cod and lamb is a savory truffle rice out of a beautiful wood and cast iron steamer. 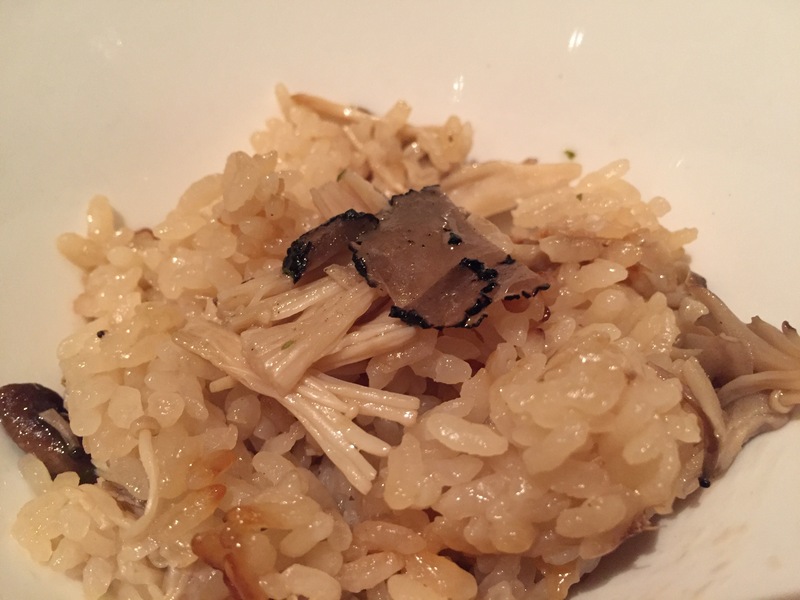 We counted at least six different mushrooms (truffle, shiitake, inoki, morel, straw, and one we couldn’t name) but it’s just getting too heavy at this point in the meal and goes half-uneaten. Dessert was gorgeous, but a little disjointed in flavors. 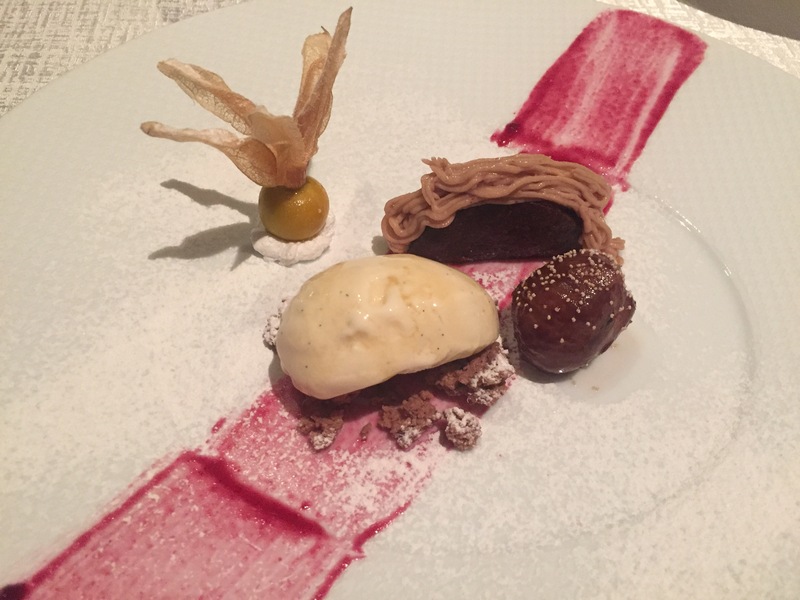 A light ice cream was served with a granola, an unnecessary gooseberry, a smear of berry compote, and what can eat be described as a choco-taco with hazelnut piping. 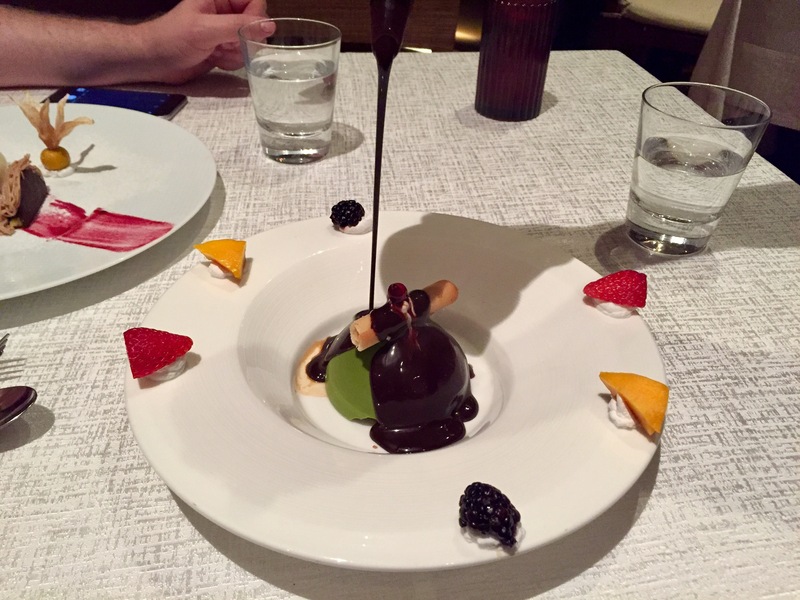 A waxy matcha dome covers ice cream, and hot chocolate is poured on top but fails to melt through as intended. Even though it didn’t do what was supposed to, it was still delicious, though insanely rich. We could only stomach a few bites. Our conclusion is that Wasabi is a bit hit-or-miss. 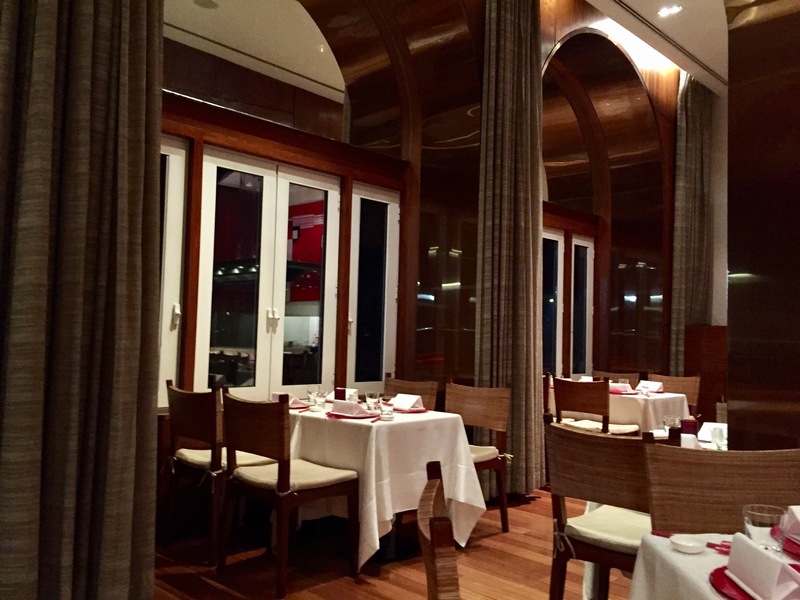 Perhaps the night after Valentine’s Day is an off evening, or standards slip slightly when the owner isn’t here, or perhaps we’re just asking a bit much for top-end Japanese food in a poor Indian city. 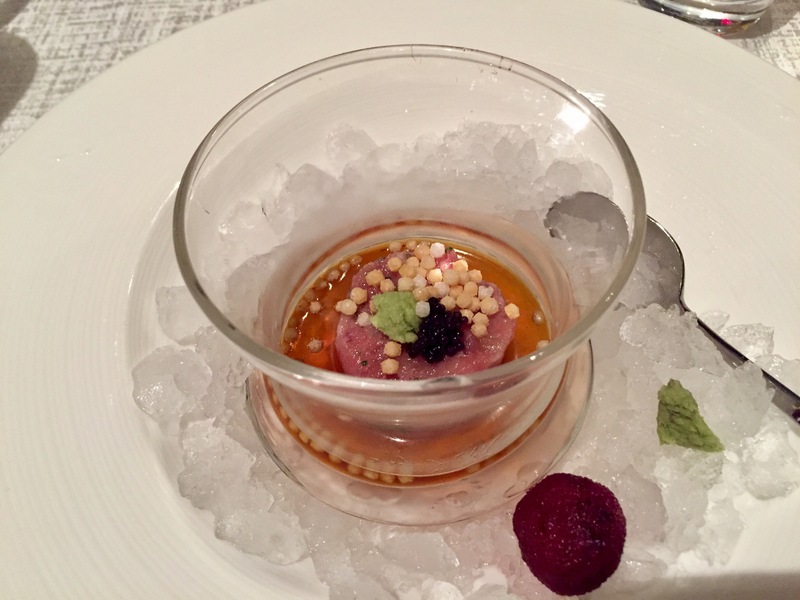 Given what we’ve seen of Mumbai, I’m sure this is stellar cuisine for the locale, but it doesn’t hold up to the world-class establishments Morimoto is known for, especially given we are spending L.A. prices on this meal. That said, I have a renewed appreciation for everyday luxuries back home in L.A after seeing first hand a city like Mumbai.